Pedicures, face masks, soap with “beads”, all of these are meant to help you remove dead skin and encourage the growth of a new layer. Did you know, however, that you can get better results with fewer chemicals by performing a technique called “Dry Skin Brushing”? Quite simply, it is the process of using a stiff-bristled brush on your skin in order to exfoliate the upper layer. Spending just a few minutes every day to brush your skin helps remove old, dead skin, which in turn gives you a glowing appearance. The act of removing old skin cells prompts the creation of a new, healthier layer of skin. It also helps clearing up and clogged pores, which helps your skin breath and prevents unsightly zits and “blackheads”. Skin Brushing also reduces cellulite by tightening the epidermis (the upper skin layer) and breaking down fat deposits that are near the skin. It’s not a replacement for good physical exercise, but rather compliments it. 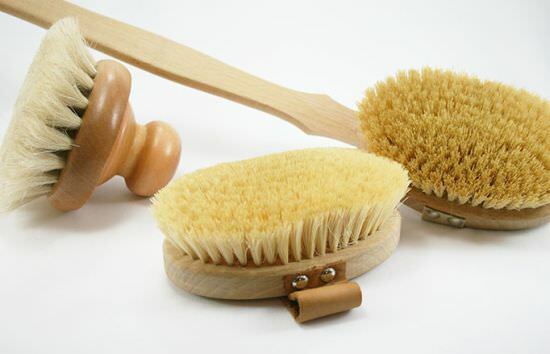 Dry brushing helps increase your blood flow by agitating the skin. It stimulates the nerve system, which helps with muscle toning. The agitated skin produces more hydration oils, essential in keeping your skin taut and elastic, and also helps in stimulating your lymphatic system, which boosts our immune system. For starters, you’ll need a brush that has a long handle and natural, stiff bristles. Once you’ve got your brush, start using it on your feet, moving the brush in long, sweeping motions. Avoid scrubbing and maintain a light pressure – you don’t want to hurt your skin (which causes redness and irritation). Once you reach your abdomen area, move the brush in counterclockwise motions, and upward movements for your back. Finish by brushing your chest, arms and hands in a similar motion to your legs. It’s advised that you avoid sensitive areas the face, for which you should get a smaller, gentler brush. Finally, it’s highly recommended that you take a shower once you’ve finished, to remove any leftover skin cells. Dry brushing shouldn’t take you more than 15 minutes in the morning, with benefits that will last a lot longer, so don’t give up after a few days – keep doing it and you’ll be amazed with the results.